Benjamin Frisch is a cartoonist and storyteller from Williamsburg, Virginia. He has an MFA in Sequential Art from Savannah College of Art and Design, and participated in the international artist residency program La Maison Des Auteurs in Angoulême, France. His work has appeared on the political satire site Wonkette, National Public Radio, and in the Graphic Canon comics anthologies; the Austin Chronicle has declared him the Best Emerging Graphic Novelist. 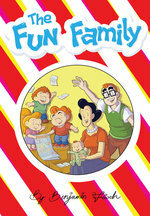 The Fun Family is his first book.